This is more of a training blog than it is LCHF blog lately. The reason is there is nothing new on the food front. I eat low carb and it is going well. But running! I love it! So much to tell! I usually do hill training on the treadmill. I managed it the first time but only because I decreased the speed to close to zero. The second time I had to stop after 15 minutes and the third time I wanted to die. Today I felt like superman. Strong, fast and unstoppable. I even added another 10 minutes sprint after the hill training. It's days like this that I am happy I signed up to the gym. The weather was terrible. Stormy winds and heavy rain. I would never have gone out running in this weather. I don't mind some rain or the cold but I don't want to torture myself. Running should be fun and British winter is not the best time for fun running. 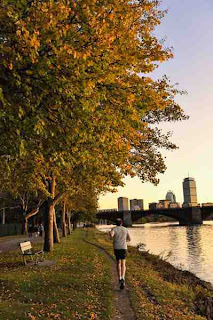 Although to be honest it was absolutely amazing running on Saturday - sunny, warm and autumn colored leaves everywhere. So there are good moments too. And for the bad days I can go to the gym. Win-win. I went running today. It felt so good I just kept going, and going, and going... I ended 13 km later :) Longest run so far and I had an average speed of 9.8 km/h. A good pace (for me at least) but I could still talk with my running partner. Marathon training is fun! Now I am watching X Factor after having my first home made meal since three weeks. Yes, I know it's not very good but at least I enjoy cooking these days. We had salmon with vegetables in a cream sauce. Very tasty! Had my first organised run today since I took up running again. It started off pretty bad actually. I was so tired when the alarm went off this morning that I stayed in bed for a while. And fell asleep. Woke up 40 min later, had quick breakfast and rushed to the run. I was walking the 2 miles very fast to get there on time. Just to find out that my watch was still on central European time since my visit to Zurich earlier this week. So I was one hour early. Not much from me lately, things have been very busy lately.